The guide is intended to be relevant to all Canadians. Mentions are even made of attempts to be inclusive of Indigenous people. But there is still plenty of work to be done to better reflect the dietary needs of Indigenous people across the country. Besides seeking advice from the recently released guide, government officials are encouraging Indigenous people to continue utilizing the 2007 version of Canada’s Food Guide – First Nations, Inuit and Metis as a source for healthy eating. That Indigenous guide came out about six months after Canada’s Food Guide was last released a dozen years ago. Dr. Hasan Hutchinson, the director general of the Office of Nutrition Policy and Promotion at Health Canada, said an updated Indigenous guide will also be produced at some point. “The next phase is we’re having much closer engagements with Indigenous people and their communities,” Hutchinson said. Representatives from the Assembly of First Nations, Metis National Council and the Inuit Tapiriit Kanatami will be included in those discussions. “It’s not something the Canadian government is going to do by itself,” Hutchinson said of the upcoming Indigenous guide. The consultations with various groups will help determine what will be included in the revised Indigenous guide. “That will depend on which direction to go,” Hutchinson said, adding he is not certain how long it will take for the updated Indigenous guide to be released. As for the latest food guide that just came out, there is a heavy emphasis on having one’s plate full of fruits and vegetables. And instead of having meat as a source of protein the guide is suggesting plant-based proteins, including beans and tofu, as a better way to consume proteins. This new guide doesn’t align with many Nuu-chah-nulth people who tend to eat a greater percentage of seafood compared to other Canadians. And Indigenous people in general tend to eat more meat, such as moose and elk, as part of their culture. Matilda Atleo, a health promotions worker for the Nuu-chah-nulth Tribal Council, had some mixed reactions upon seeing details of the new guide. Filling up one’s plate with fruits and vegetables might sound easy but it can provide a number of challenges for Indigenous people. “There’s always the thought of what do you do with our low-income families that can’t purchase fresh fruits and vegetables,” Atleo said. Atleo added she’s not sure how many Nuu-chah-nulth residents would actually follow recommendations in the national food guide. “The reality is I’m not sure how many would go by the guide,” she said. Atleo, who has been working at her job for 17 years, realizes she still has quite a bit of education to provide to Nuu-chah-nulth-aht on their food habits. “If they make their own bread, I’m suggesting they increase the fibre and add whole wheat,” Atleo said. She’s also suggesting brown rice and whole wheat pasta are preferred options over white rice and plain pasta. Atleo, who has a number of health speaking engagements each year, is pleased with certain elements of the new guide. Atleo also has an opinion of what would allow Nuu-chah-nulth people to be healthier. “I think First Nations people should be encouraged to have their own community gardens,” she said. Atleo said just three of the 14 Nuu-chah-nulth nations currently have a community garden. They are the Tseshaht, Ucluelet and Ehattesaht First Nations. Atleo was encouraged to see the new guide focus on the importance of consuming water, instead of sugary drinks which includes juices. 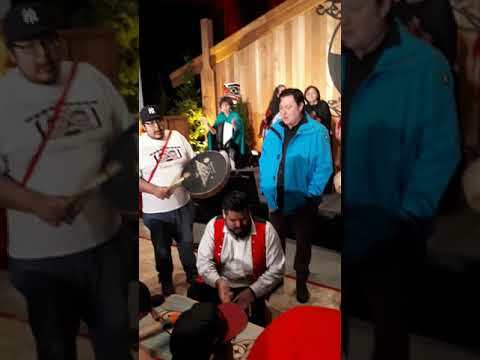 To better serve not only Nuu-chah-nulth but also other Indigenous people as well, Atleo agrees an updated Indigenous guide needs to be produced. “I think there is more work to be done,” she said.